I’m a big fan of traditional wedding cakes – white frosting, flowers, cake topper. But I’m also becoming a fan of the more non-traditional cakes we’ve been featuring here. 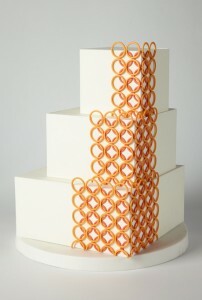 And every now and then I find an ultra modern wedding cake that knocks my socks off. This is one of those cakes. From the straight lines of the square tiers to the 3D illusion of the sugar paste rings, this cake has it going on! I love the super sleek white icing on the cake – it creates the perfect stark backdrop for the two-toned geometric design on the side of the cake. This cake would be ideal any time of the year and I bet you could coordinate the color of the sugar paste rings to your wedding colors. I would love to see this with deep red rings. Or maybe even blue. Oh the drama! This cake was created by Gateaux Inc.